So much more than a book, with QR codes and access to an online course included. What do you get with the Quick Pitch Guide? All the tools explained in person by international Pitch Coach David Beckett. A beautifully designed practical guide to building your winning pitch. Examples of the tools in action, instantly accessed via QR codes. 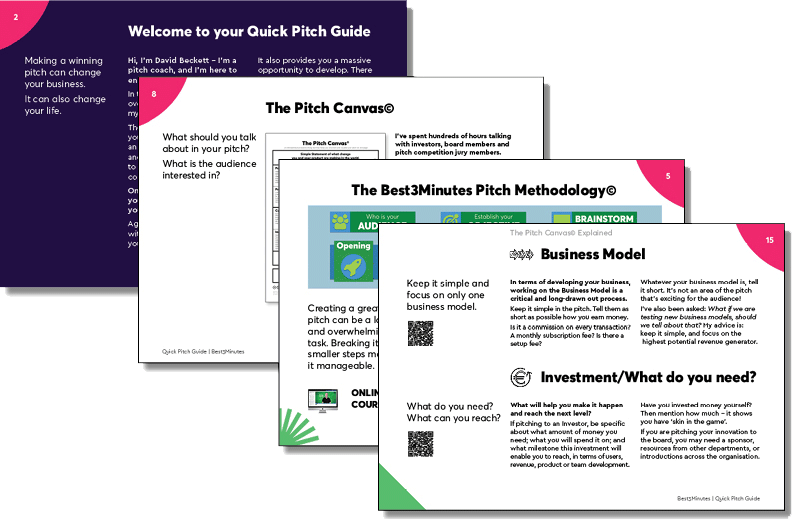 The tools in this Quick Pitch Guide are used by numerous Startups, Accelerators and Corporates to develop innovative, winning pitches. READY TO LEARN TO PITCH? Pitch Training for Corporate Innovation Teams and Startup Accelerators. Keynotes on Pitching. Half Day or Full Day Workshop for Innovation teams and anyone who presents the company. Copyright 2018 Best3Minutes | All Rights Reserved | Created by Webodew - Bring energy to the web!